The transportation system affects the experiences of every resident, visitor, and business in Central Florida. Planning done years ago touches us today, and likewise, the planning we do today shapes tomorrow. 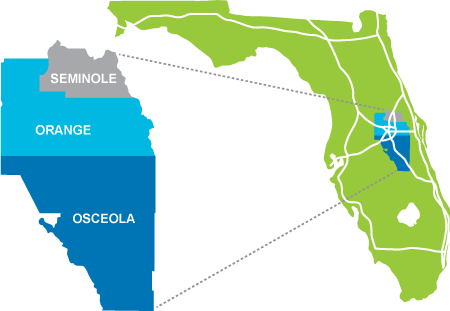 MetroPlan Orlando leads transportation planning efforts in Orange, Osceola, and Seminole counties. We coordinate closely with elected officials, industry experts, and the community to shape a future system that offers travel options. As the metropolitan planning organization for Central Florida, we also set priorities and determine how federal and state transportation dollars are spent in the region. A regional transportation system that safely and efficiently moves people and goods through a variety of options that support the region's vitality. To provide leadership in transportation planning by engaging the public and fostering effective partnerships. Ways to contact our staff. Check out our accomplishments from past years. Funding partners and annual financial reports. Our background and laws that govern our work.